Learn how to defeat the Juzou the Drunkard boss fight in Sekiro: Shadows Die Twice, as well a strategy to help cheese one deathblow. 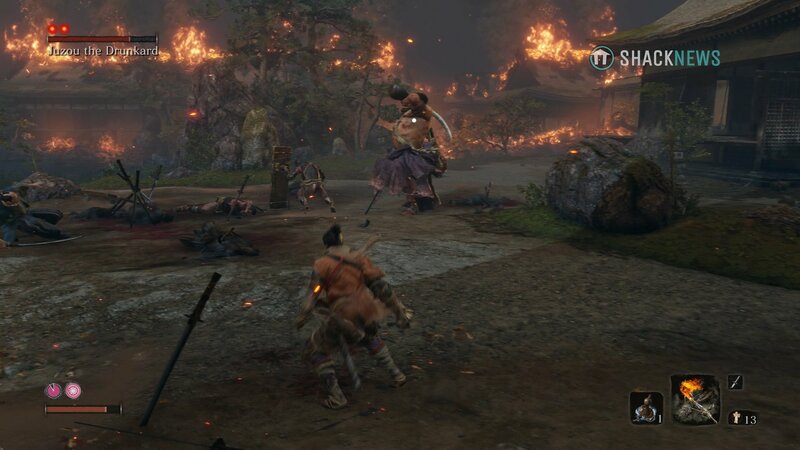 Beating Juzou the Drunkard in Sekiro: Shadows Die Twice can be challenging, especially if you don’t have a proper strategy. Thankfully, Juzou the Drunkard isn’t that hard if you can clear the enemies, remove one deathblow, and get an NPC to help you. The only Sculptor’s Idol near Juzou the Drunkard is found in the Hirata Estate Main Hall. This means each run to the boss will take you past a dozen or more soldiers. In order to avoid unnecessary fighting and potentially using healing gourd charges, take a safer route. It’s also worth collecting any and all prayer beads, as the more health you have the easier this fight will become. From the Sculptor’s Idol, run down the alleyway and dispatch the one soldier. From here, grapple up to the roof and run around the corner. Grapple to the next roof and sprint down to the end. Drop down and turn left and run toward the pond. Instead of running past the NPC and directly at Juzou, cut across the pond to the opposite side. From this position, you can enter the house and prepare for the first part of the Juzou the Drunkard boss fight. Once inside the house, sneak around and take down the first soldier. Kill the second soldier by overpowering him. Continue sneaking through the house, sticking close to the left wall. You should come out behind a shield soldier. Deathblow the shield soldier and then quickly run back to where you entered the house. At this point, you should continue doing laps of the arena until all the soldiers are dead and it’s just you and Juzou the Drunkard. With just Juzou the Drunkard alive, sneak into the house and wait for him to stop hunting you. You may need to bait him back to where he starts and then run away. After he’s stopped searching, sneak through the house and behind Juzou (provided he’s standing in the open) and then perform a stealth deathblow from behind. This will ensure you only need to break his posture once. Now, quickly run and speak with Nogami Gensai, the NPC standing in the pond. You will need to quickly skip through his dialogue. He will run in to battle and assist you with the boss fight. By having an NPC help you, the Juzou the Drunkard fight becomes somewhat trivial. Juzou the Drunkard doesn’t have a lot of combos or means of blocking. For this reason, you can just whittle down his health with ease. However, he does have a lot of heavy attacks, which deal considerable damage. Juzou the Drunkard will drink some sake to recharge his vomiting/spitting attack. Drinking and vomiting: Whenever Juzou drinks, he is restocking his vomit-blast move. From this point on, look out for his vomiting move which, when avoided, is a great opportunity for vitality damage. Danger grab attack: Juzou the Drunkard has a well-telegraphed grab move. He pulls back his left arm, a danger symbol will flash, and then he will lunge forward. This can be avoided by quickly stepping backwards or dodging out of the way. Low-sweep attack: Another dangerous move Juzou uses is a low-sweep attack. Juzou will bend down real low with his sword-hand almost touching the ground. From here, he will sweep his sword out, dealing considerable damage. Look out for his bending motion and the danger symbol and prepare to jump over it and mid-air kick him. Don't do what I do, which is get hit and lose a lot of health. Depending on when you fight Juzou the Drunkard will alter how well you perform in this boss fight. For some, this could be the first major encounter while for others they may have already fought the likes of Gyoubu Oniwa. If Juzou is your first big boss encounter, don’t let your lack of skill and finesse discourage you. It’s entirely possible to fumble your way through this fight and still come out on top. With Juzou the Drunkard defeated and his unrefined sake claimed, the next boss that awaits is Lady Butterfly. 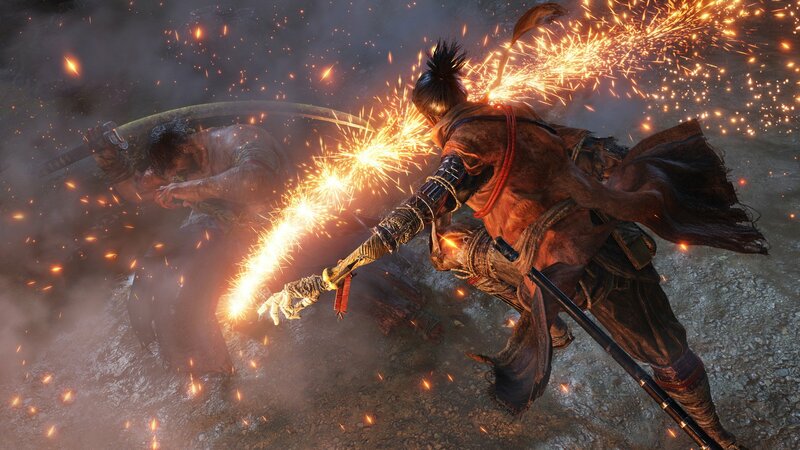 For more Sekiro: Shadows Die Twice boss guides, you’re already in the right place.